Several major international press freedom organizations have called for charges to be dropped against six journalists arrested while covering unrest in Washington DC on Donald Trump’s inauguration day last week. They all now face up to 10 years in prison. RT America’s Alexander Rubinstein was among the journalists arrested along with protesters on January 20th. He has been charged with inciting a riot, the highest level offense under the District of Columbia’s public disturbances law. The reporters were released a day after being arrested, but still face court hearings. They could each be sentenced to 10 years behind bars and fined up to $25,000 if convicted. Preliminary hearings are scheduled for February and March, according to court filings. In an official statement, RT’s press office slammed the charges against Rubinstein. 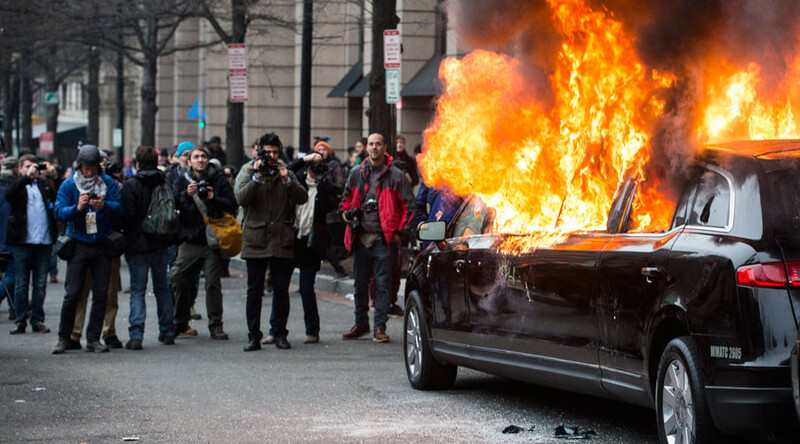 “The arrest and subsequent felony rioting charge against our reporter, Alexander Rubinstein, simply for doing his job – covering inauguration protests in Washington DC – is an absolute outrage. Such acts represent an egregious violation of journalistic freedom, and are particularly disheartening to witness in the country that positions itself as the global champion of free press,” the statement says. “RT will apply the full weight of its legal team in support of our journalist and we are confident that a thorough review by the U.S. Attorney’s office will confirm that Alexander, who wore his press credentials at all times, was wrongfully arrested,” it added. Speaking on the case, the head of RT America, Mikhail Solodovnikov, said that while covering the protest, Rubinstein was clearly marked as journalist since he was wearing a jacket with the RT America logo on it. “Of course, a huge amount of evidence indicates that Alex Rubenstein was doing his journalistic duty in the first place and followed all the standards and norms,” Solodovnikov said. The RT America chief noted that he hopes the “mistake” will be “corrected” when Rubinstein has his court hearing. The Society of Professional Journalists (SPJ), the oldest US organization representing journalists, said the arrests appeared to be in violation of press freedom. “SPJ agrees that reporters being arrested while covering protests is a violation of journalistic freedom. No journalist should be arrested while covering the news and doing his or her job,” Lynn Walsh, National President of the Society of Professional Journalists, told RT. A spokesperson for Vocativ said in a statement to RT that the arrest of journalist Evan Engel violates the First Amendment. “The arrest, detainment and rioting charge against journalist Evan Engel, who was covering the protests for Vocativ, are an affront to the First Amendment and journalistic freedom. Vocativ will vigorously contest this unfounded and outrageous charge,” Vocativ said in the statement. On Tuesday, the Organization for Security and Co-operation in Europe’s (OSCE’s) Representative on Freedom of the Media, Dunja Mijatovic, called on authorities in the US to respect the right of journalists to report on public demonstrations and uphold freedom of the press. “The media has a critical role to play in democracies by providing transparency as well as accountability of the exercise of state power. This public watchdog function is especially important around the time of elections and during changes of government, including at the time of inauguration. As long as it is not proved that journalists have taken a direct and active part in hostilities themselves, their activities during public demonstrations should be left unimpaired,” she said in an official statement published on the OSCE’s website. The official added that the rights of journalists are guaranteed by the First Amendment of the US Constitution, as well as by Article 19 of the International Covenant on Civil Rights, which the United States has ratified. Reporters Without Borders (RSF) has also called for the felony charges against the journalists to be dropped, saying the organization is “alarmed by the new administration’s repeated attacks on the media and blatant disregard for facts in the first three days of Donald Trump’s presidency... RSF calls on Trump and his team to stop undermining the First Amendment and start defending it,” according to a statement on their website. “These charges are clearly inappropriate, and we are concerned that they could send a chilling message to journalists covering future protests… We call on authorities in Washington to drop these charges immediately,” Carlos Lauria, senior Americas program coordinator, said in a statement on Tuesday, as cited by Sputnik news agency. Among the six journalists charged are Jack Keller, a documentary producer for the web documentary series Story of America; Shay Horse, an independent photojournalist; live-streamer Matt Hopard and freelance reporter Aaron Cantu, as well as Vocativ journalist Evan Engel and Alexander Rubinstein of RT America. Rubinstein stressed that he showed his media credentials to police when he was arrested, but said it had made no difference. RT America had many reporters covering the inauguration in various locales. Rubinstein was following the DisruptJ20 anti-capitalist march. In total, over 200 people were arrested during inauguration day riots. 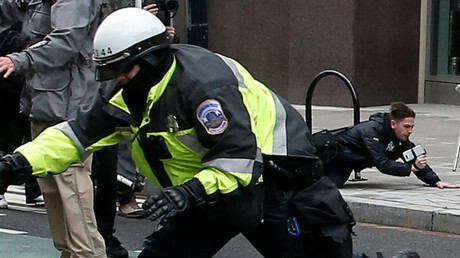 The National Lawyers’ Guild, a US-based association of lawyers working in the public interest and other activist legal workers, said that Washington DC police had “indiscriminately targeted people for arrest en masse based on location alone.” Police are also accused of unlawfully using teargas and violating § 5–331.07, an ordinance that regulates how police should deal with and respond to First Amendment assemblies that prohibits kettling and mass arrests. It also requires that police to give dispersal warnings before pepper-spraying rioters. “These illegal acts are clearly designed to chill the speech of protesters engaging in First Amendment activity,” Maggie Ellinger-Locke of the guild’s DC branch said in a statement published on the group’s website.